Eventually, there comes a time when you’ll have to shop for and buy a new mattress. At first thought, this task may sound easy enough, but not many people realize there are several factors to consider when it’s time to start shopping. Among the most important of those is understanding mattress sizes and knowing how to find the best one for you. 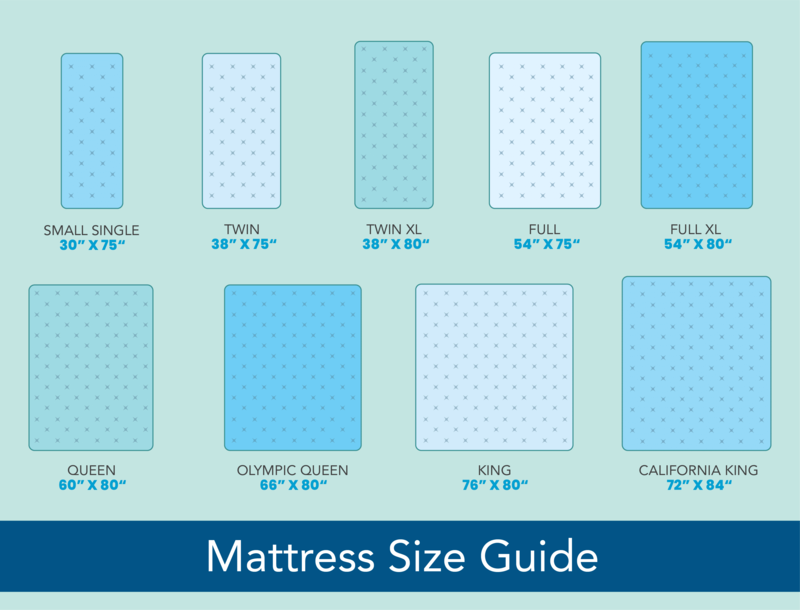 An overview of the different mattress sizes, including dimensions and recommended room sizes for each. Factors to consider when picking the best mattress size for you. The California King mattress is the longest mattress type available, having an additional 4″ of length compared to the standard King mattress. While the California King does have an extra 4 inches of legroom in comparison to the King, it is 4 inches narrower. What it gains in length, it loses in width. Cal Kings are ideal for taller people who need the extra sleeping room at the head or foot of their beds. The size of a King mattress is equal to the dimensions of two TwinXL mattresses pushed side by side, making them a good choice for couples who are wanting a little more sleeping room than what’s offered by the Queen. 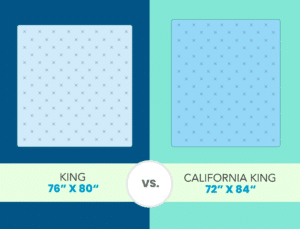 Because the King dimensions are equal to that of two TwinXLs, many mattress brands sell a Split-King bed, which is actually just two Twin XL mattresses. Split-King’s are great for choice for couples who have an adjustable base and want to move each side independently, or for couples who have different sleep styles and prefer mattresses of varying firmness. Olympic Queen Mattresses are a bit wider than Queen mattresses, which is perfect for couples, or individuals, who like to spread out during the night. Olympic Queen mattresses also are a good middle ground between a Queen and a King in regards to width, so if your room isn’t accommodating of a King, you could still get a wider mattress by buying an Olympic Queen. 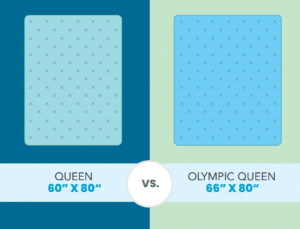 The one thing about Olympic Queens is that they can be hard to find because they’re not considered to be a “standard size,” and most mattress brands only carry standard sizes. To find an Olympic queen, you may need to shop around at mattress retailers in your area. Another thing to note is it may be harder to find accessories, such as sheets and mattress covers, for Olympic Queen mattresses. All in all, these mattresses are ideal for taller couples or couples who would like a little more room without fully upgrading to a King size mattress. Queen mattresses are among the most popular sizes for couples today. With dimensions of 60″ x 80″, Queen mattresses can fit in most any room, so many people don’t think twice about buying a Queen bed. Queen size mattresses are also a go-to for guest rooms because they can be accommodating of both singles and couples and still leave plenty of extra space in the bedroom. These mattresses are ideal for couples who don’t require too much sleeping space or individuals who crave extra space to sprawl out while they sleep. 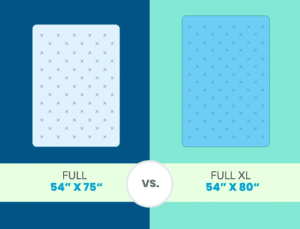 The Full XL mattress has an additional 5 inches of length than the regular Full size, making it an ideal option for taller individuals. Full mattresses are usually a go-to choice for most individuals— it offers more room than a Twin, but it’s not as large as a Queen so that it can fit in smaller rooms. These beds are perfect for those who don’t share their mattress and should provide enough space to sleep comfortably. When it comes to couples, or even those who often find themselves sharing their bed with their pet, a Full mattress may not have enough space to allow you to sleep comfortably. If you share your bed, we would recommend looking for a larger size. Simply put, full mattresses are good for one person. 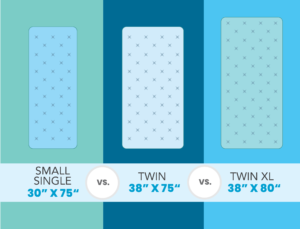 Twin XL mattresses are 5″ longer than Twin mattresses, making them a good choice for those who want more legroom from their bed but do not have a room large enough to accommodate a bigger mattress. As we mentioned earlier, this size is also popular for couples looking to buy a Split-King bed. Recommended Minimum Room Size: 7′ x 10′. For bunk beds, we recommend a minimum 3′ ceiling clearance. Twins are the smallest of standard sizes and are typically used by children who aren’t yet grown enough for a Full size. Twin mattresses are suitable for guest rooms that have more than one bed, and they’re also most compatible with bunk beds. If you have a tinier bedroom, this size should fit and still leave extra room for other furniture. For full-grown adults, this size may be too small, but it’s great for children and teens alike. Small single mattresses are the typical size for cribs, though they often serve as toddler beds. They’re ideal for babies and toddlers. Now that we’ve covered the sizes of mattresses available, it’s time to talk about how to choose the best size for you. Because a mattress is an expensive purchase, it’s important to make sure your investment will not only be worth it but that it will fit in your bedroom without causing issues. Being realistic about your room size, sleep preferences, and budget is critical when making a decision like so. Below, we’ve provided more information about the factors to consider when choosing your next mattresses size so you can buy the best mattress for the money. Below is the recommended minimum bedroom measurements for each size. In addition to the size of your bedroom, remember to consider the shape. If your bedroom is not a perfect square and is perhaps more rectangular, it may be harder to fit a larger bed size. That’s not all. Think about the mattress you’re currently sleeping on. Is there anything you would change about it? Some factors to consider would include your preference for walking space and the arrangement of your furniture. If you want more walking space in your bedroom, choosing a smaller mattress than what you have is a solution to that problem. If you’re planning on adding new furniture to your bedroom or rearranging the furniture that’s already in there, it can affect the space you have designated for your bed. Carefully measure your bedroom and the furniture inside to get an accurate sense of how much room you have for your mattress. Bedroom dimensions aside, consider the location of your bedroom. Large mattresses, such as King or California King sizes, are harder to maneuver due to their size and weight. Before purchasing, take measurements of doorways and stairwells to make sure the mattress can reach your bedroom. Additionally, it’s important to think about the possibility of moving in the future. The average lifespan of a mattress is 7 to 10 years— if you plan on moving within the decade after purchasing your bed, remember the bed you buy today needs to be able to fit in your future home. In general, we believe Full mattresses work for most individuals while Queen size mattresses are a suitable starting point for most couples. However, everyone’s situation and preferences are different, so understanding who will be using the bed can help determine the proper size. Of course, you must factor in your own preferences and sleeping habits. Do you typically like to sprawl out across your mattress when you’re asleep? Alternatively, do you prefer to curl up and stay that way all night long? Your sleeping position could be enough to justify upgrading to a larger bed, or getting away with a slightly smaller one. A good-quality mattress can be a worthwhile investment in your quality of sleep and overall health. Before you start your search, it’s important to take a step back and set a realistic budget for yourself. With your budget in mind, you can then begin to look at specific brands, mattress reviews, models, materials, and sizes. Whether you’re a single person looking for some extra legroom or more room on the sides, there’s good news— no matter your situation, the most comfortable mattress is out there for you. Now, equipped with your new knowledge, you’re ready to go find it!